Other locations will be charged best rate available. 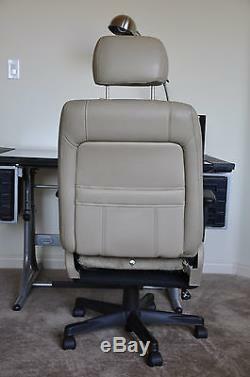 This office chair was made by combining a brand new donor office chair with a seat removed from the passenger side of an Acura Legend. 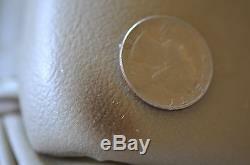 It has been thoroughly cleaned and is in very nice overall condition as you can see in the pictures above. 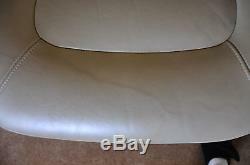 The seat is upholstered in its original Shadow Ivory leather. 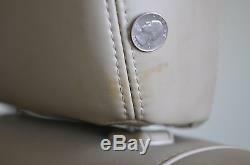 All the leather is in excellent condition, but there are two spots of discoloration as shown in the pictures. One is on the headrest and the other is at the bottom rear of the seat. The hard plastic trim has a scratch about one inch long. 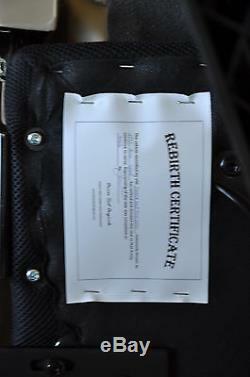 Another picture shows some wrinkling of the leather near the front of the seat. 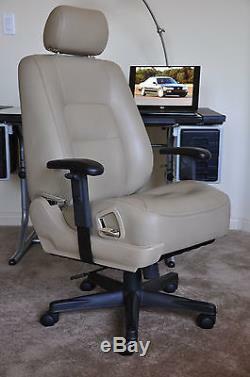 All of the non-Acura parts of the chair are new. Only simple hand tools are required. 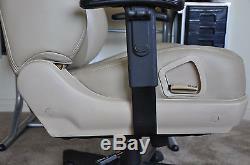 This chair retains the Acura reclining mechanism and adjustable headrest height. And, it has all the standard features you would expect from an office chair, such as swivel, tilt, tension adjust, height adjustment, adjustable arms etc. This is a very unique item that is near impossible to find anywhere and would make a great gift too. Please feel free to ask any questions. I put together the first of these chairs after having a couple of store-bought office chairs with foam cushions that quickly became flattened and useless and made it feel like I was sitting on a park bench at work all day. 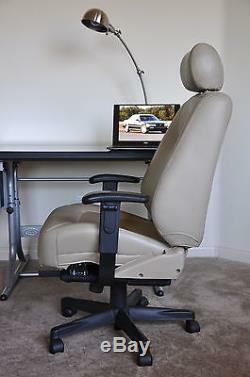 Automobile seats are designed for long-distance comfort and I thought they might make a great office chair. It turns out they do. 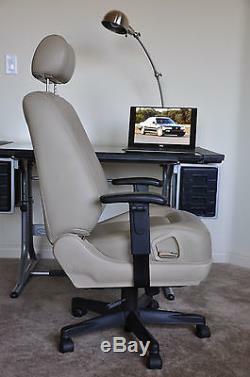 They provide all-day comfort in the office just like they do in the cars. They typically use a combination of padding and steel springs rather than a single piece of foam over plywood or plastic like most office chairs and they simply don't degrade like regular office chairs. I've been using a Mercedes chair in my office since August 2014 and couldn't be happier. One day a coworker saw my new chair, said it was the coolest thing she's ever seen and thought I should try making them for other people too, so here we are. I've learned a few things by using one of these chairs daily and by having built many others. So, I've upgraded the design of this chair as a result. 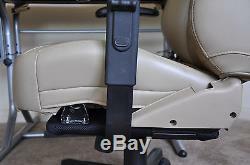 The weight capacity of this chair is 300 pounds and the top of the seat cushion can be adjusted from 19 - 22. Need a chair that's a little taller? Just send me a message with your requirements and I will probably be able to accommodate you. Please check my other items for sale if this isn't exactly what you're looking for. I'm usually working on several chairs at a time, so there should be others coming soon. Acura Alfa Romeo Aston Martin Audi BMW Bentley Cadillac Camaro Corvette Ferrari Fiat Honda Hyundai Infiniti Jaguar Jeep Lamborghini Land Rover Lexus Lincoln Lotus Maserati Mazda Mercedes Mitsubishi Mustang NSX Nissan Porsche SAAB Toyota Viper Volkswagen Volvo. The item "Acura Legend Leather Car Seat Executive Manager Office Gaming Race Chair" is in sale since Saturday, July 23, 2016. 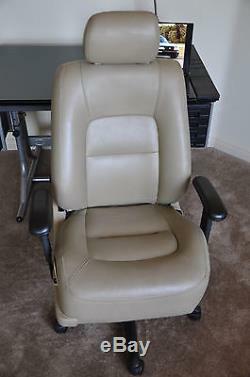 This item is in the category "Business & Industrial\Office\Office Furniture\Chairs". 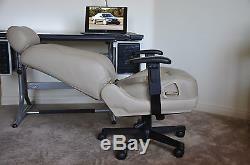 The seller is "thedriversseat" and is located in Bakersfield, California. This item can be shipped worldwide. Seat Width: cushion width: 20"